Let’s talk about AFA’s company culture. How would you describe it and how does it permeate through the organization? R. KLEINMAN: We have a lot of people here a very long time, with 20-30+ years not uncommon. We have a lot of people here whose family is here, the brother, the cousin. It’s a large company in the industry but we still have a familial feel and people get to know each other rather than just being a number. We’re interested and we’ve always cared about the employees. We want to make sure they have proper benefits, that they realize we care about them. HYLE: Compared to most organizations out there, there is a profound sense of reciprocal loyalty that you just typically don’t see in the business environment today. There’s reciprocal loyalty from the management to the employee base and from the employee base back up through the organization. It’s really unique. J. KLEINMAN: There’s a certain sense of doing the right thing, and that’s cultural and that starts from the top. We’ve learned through the years we might not always get it correct the first time, but ultimately we always do the right thing and always finish the job. We’re not the type of people who would leave an associate or customer in a bad situation. We’ll trudge through it and get the job done regardless of the circumstance. There’s a sense of integrity that goes along with that. HYLE: Our employees serve as ambassadors of our organization to the marketplace. There is a true sense of wanting to make this organization the best it can be. Let’s discuss the competition. What are the chief differentiators for AFA in the marketplace? R. KLEINMAN: It depends where we’re located, that branch. A differentiator for us is that we can do everything from the beginning to the end when it comes to fire, burglary, access control or CCTV. We can install, we can service, we can maintain, we can monitor and we can file with the Authority Having Jurisdiction. 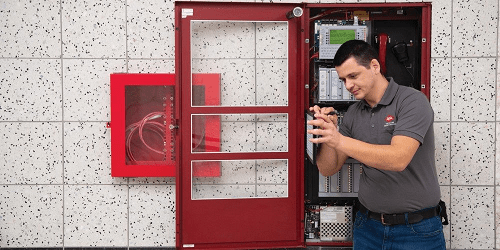 We have licensed electricians on staff and we have professional engineers we can use, so we can take a job from the design process to the filing to the installation to the inspection to the test to the follow-up, everything. We’re there for the long term. That’s a major differentiator. The company was started primarily with fire and we never really lost that focus. While many in the industry have become enamored with residential and whatever the new thing is, we have stayed the course. 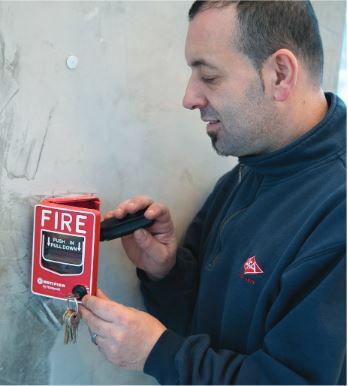 No matter what, you need a fire alarm system. It needs to be monitored and it needs to be inspected and maintained, and that’s the field we’re in. We do other things too, but we have five people at the company on NFPA 72 committees and we have a lot of NICET certified employees. In that fire business, we use NOTIFIER as our primary product. Years ago, we had a proprietary product that was one of the first ones for high-rise systems. But we are not a manufacturing company and we decided not to be proprietary. That is because for a proprietary system it might be good at the beginning for a building owner or a person putting a building up on spec, but whoever ends up with that system is going to end up paying a big bill since there’s only one place to go. That means it doesn’t matter if the service is good, it doesn’t matter whatever they need done, it can only be handled by the company where they bought the equipment. Whereas for a nonproprietary system, which we now use, the customer has choices. We have to be basically on our ‘A’ game all the time or they switch. That forces us to give the type of service the customer wants and deserves. HYLE: To build on Richard’s point, our strength and competency in life safety, specifically fire alarm, facilitates our ability to become a full-service provider to our clients. Obviously, our responsiveness, the quality of service we provide, that triggers new opportunities for us across all of our retail chain accounts. So in the cases where we lead with fire, it’s not uncommon for us to build on that through security as well as video, you name it. J. KLEINMAN: What we’re facing with competition a lot of the time is there’s a race to the bottom. People are trying to just give away equipment in order to get in there. That’s not the game we’re in. We believe we offer a better quality of service and we do our best to get the job right the first time. We’re not just throwing equipment in so we can plant a flag in a building and leave that customer stuck with us and a contract. We know we’re in a business that’s highly competitive and have to service the customer correctly so they stay with us for the long haul. That’s the kind of relationships we try to build and why I believe we have one of the lowest attrition rates in the industry. A challenge we have is being known as the oldest central station monitoring company and a lot of people think we’re only that when we’re capable of doing everything. We’re able to design-build, we can expedite, we can create, we can install the actual equipment and we service it afterward. Since people don’t realize that — for example if Kleenex started making another product you’re still going to think of them as a tissue company — we’re trying to break that mental construct and it is difficult. What makes us different and unique, what I use to sell our brand, is our responsiveness is better. We’ll get back to the customer. We won’t leave a customer hanging. We’re there, we’re their partner and they can trust us. Nobody can boast about the longevity we’ve had, so I always harp on the experience. When you put those things together, that’s our value proposition. 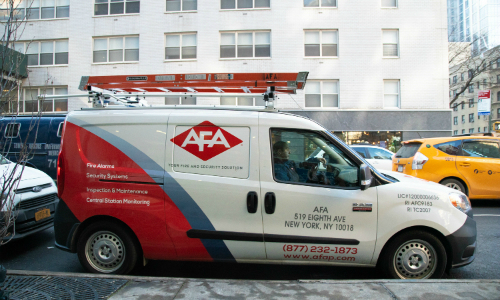 While AFA Protective today offers myriad services, its roots are in fire systems and that still comprises approximately 60% of the firm’s business. Specialities include installation, maintenance and inspections. Let’s move on to technology. Looking at it from the fire/life-safety and security perspectives, what excites you right now and why? SLATTERY: On the fire side, the newest and most interesting technology is the introduction of BDAs, or bidirectional amplifiers. We’re in the process of getting people in all of our branches licensed with their FCC general radio operators’ license, or GROL, and trained on bidirectional amplifiers. This is in anticipation and preparation for the larger urban markets around the country to start requiring them to allow first responders within a facility to maintain radio communication between each other without interruption. That’s new. That’s exciting for us. We’re preparing like it’s going to be a big part of the fire alarm market, and if it is then we’ll be ready. 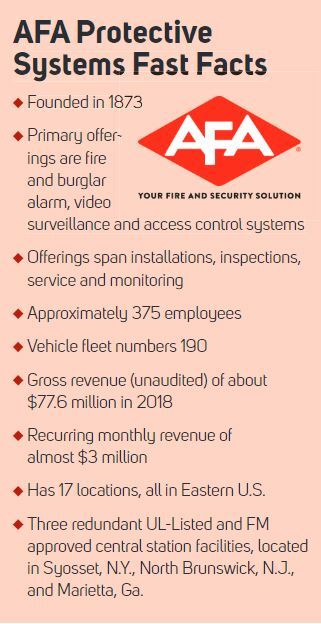 LABUA: You could probably add the whole IP and cellular transition into that category, as well as the wireless capabilities that are being developed for enterprise-class fire alarm systems. R. KLEINMAN: The cellular and Internet area is a big push for us as it did not really come of age for the fire market until recently. Moving alarm transmission to Internet and cell gives the customer two paths of communication and two different technologies. For those in the Northeast who experienced Hurricane Sandy and other weather issues, having a second source to be able to transmit a signal on a different technology is very helpful. We’re excited about the opportunities in these areas. HYLE: It’s not only about the technology changes but also the use of technology. We really go the extra mile with our chain accounts to listen to their pain points, trying to discover how we can truly act in the capacity of a solution provider and address issues they would otherwise be hard pressed to solve. For one customer that had shrink issues we were able to reduce loss associated with organized retail crime and in the course of doing so, improve sales within that particular department. It was something unique that didn’t exist anywhere else in the marketplace and the customer was extremely appreciative. The broader mission with technology is to try to better understand how we can truly act in the capacity of a solution provider for all of our customers. It’s not just about saying it. Get an inside look at AFA with this slideshow.